Thank you Pacey’s Pianos for helping us find the perfect piano. My parents bought our first piano from Pacey’s Pianos more than 30 years ago. 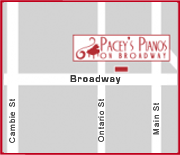 When I decided to my buy my own piano for our family I came to Pacey’s Pianos. What a true family tradition!